You can earn parts of the secret by reaching different goals in minigames. The secret is: Reaver Yoffin na Nilfast. Say it when playing and wave 46 will be activate, in that wave you fight a big tauren on each side. 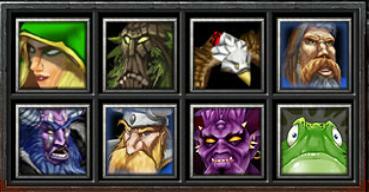 If you got some towers which poison your enemies or frost them you should put them all on one hotkey and target one mob after another instead of letting them autoattack only the first one. This way the mobs take up to 3x the time they usually would need to leave your maze. If the mobs are close to each other or if its just one mob (Emoo in secret wave 46), then you can use this trick. Especially in wave 46 you should use it, because you are weakened from attacking bosses. In other waves it costs you gold and you shouldnt really use it there. 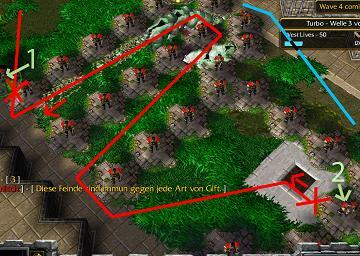 You need a maze, which got a waypoint inside and there has to be a free space to one wall next to the maze (blue line). When the mob(s) is/are gettin close to the entrance (1) of your maze the 2nd time, you need to sell one tower at the other end of your maze (2) to open the maze there up and build one at the entrance (1) to close the maze there. The mob/s will run to the other end (1) again and then you should sell the blocking tower at the entrance (1) and build one infront of him (2) again at your waypoint. You can repeat this until you got no more gold, but you can also sell a part of your maze to build more cheap towers. Well, I played this map about 5 thousands of times and made some macros for this map. After all that time listening to answers of people etc i improved these questions more and more. 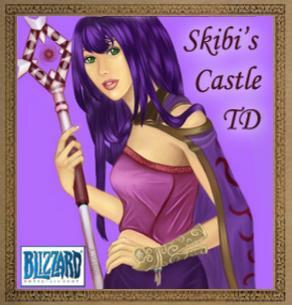 Which two Skibis Castle TD builders can >only< be chosen at gamestart and not later? Which mobs give 5 gold in the Turbotrack (race) minigame? Which mob are you fighting against at wave 46? Because people requested it I created some kinda Bot, which types those questions once you press your Roll key.. if you have one that is. Either download Skibis Castle Question Bot or get the Bot Source Code to modify it or if you just don't trust me- actually you shouldn't trust any programs you haven't bought or made by yourself. Tell me the name of a builder or describe it. You may not say one you already heard before. When asking both kinds of questions you have to pay attention that people don't hear an answer and just repeat it directly or after rejoining. Immediately kick everyone who says something like "i pro","go","slot","open","east" or something in Capslock or someone who says more than 1 "?". Well, you usually do not need this tactic, because arcane is already easily to never leak with if you know how to. Still im telling you this nice other tactic to have fun with. Well, it is not working all the time, because there are stun-immunity-mobs and maybe WB-Effect-mobs could be a problem too depending on your maze, which brings them on one point. 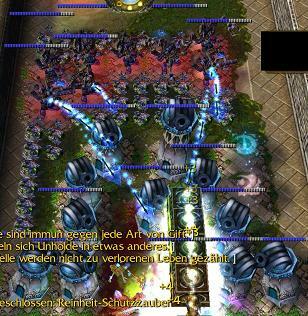 You need to concentrate all mobs to one point, where all your stun-towers automatically shoot to. Your mazeway has to be very tight and you need many different slowtowers. Also your stuntowers need many manaspringtowers.